My friends who’ve seen me walk around with a GPS as I take pictures on vacation or hikes think I’m a little bit odd. But apparently, I’m not the only one. In the 15 months since Flickr officially supported geotagging, more than 35 million pictures have been geotagged — enough that they can launch Flickr Places to show them off. One of my big complaints with most travel sites is that they downplay the visual and visceral elements that make travel fun. At Flickr Places, that’s front and center. Places offers a gorgeous travelogue of places around the world. You can see pictures, Flickr groups about the location and connect with photographers. A tag cloud shows the top tags for an area; this sounds more useful than it is. Most places I searched came up with words like clouds, sunset, people, church. It’d be nice if the universal words were thrown out and the focus places on words that are unique or much more common for an area. Flickr also changed the way maps are presented. Although the maps and overall presentation are more visually appealing, some key functionality was lost. In the previous version, the map represented your search. If you zoomed in or out, the new map defined the boundaries. As a result, you could see new pictures that didn’t appear in the other view. 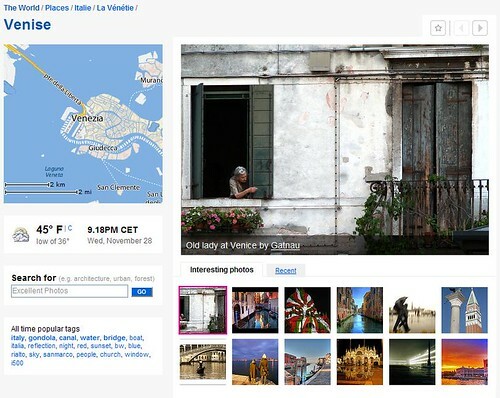 This entry was posted in flickr, geotagging, maps, mashups, travel, web 2, web 2.0. Bookmark the permalink.